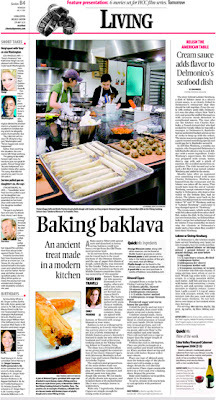 Last week I had another food column. Though it seems like I've been disinterested in blogging lately, I have high hopes for the future. Over the weekend Joe and I had our new neighbors, Taizo and Sayaka, over for hot pot. Saya has promised to invite us over for home made tempura :-) On Sunday we met a couple from South Carolina who have founded an organization called Africa for Jesus. They have lived in Tanzania and have a few favorite African dishes... which they promised to make for us when they move the AFJ office and their family to Hoptown. :-) Visions of crunchy fried veggies and ugali dipped in something tasty have been filling my head ever since. And in the very near future, my parents, Joe and I are going to take another Viking cooking class called "Superfoods" for my birthday. The idea is tasty dishes using foods rich in nutrients, omega-3s and antioxidants. Yesterday when I was making dinner something just set me off... maybe it was the spaghetti-O smell of the canned tomatoes or the eyestinging fumes of onions suspiciously labeled as sweet. Or maybe it was the unsettling squish and mush of cold ground chicken between my fingers that did it. Or the tragedy of over scorching my bell peppers, around which the entire meal was planned. I was in a very bad mood, and spiralling deeper into the mire until JOe pushed me lovingly, but firmly out the door. The frigid night air and the prospect of meeting Jennifer at the YMCA helped me get away from the stinking chaos of my kitchen. When I returned, the smelly tomatoes and the spicy onions and the chicken meatballs were all tucked neatly into the refrigerator. And I had a bowl of cereal. I was in a much better mood tonight and decided the subs actually tasted OK --not great -- but definitely edible. I'm a slacker. This quiche is a week old. No, I mean this photo is a week old. We gobbled up the quiche in a couple days. Though I don't advocate eating pre-made pie crusts-- (because of those nasty partially hydrogenated oils, etc.) I had one in my refrigerator-- which, in addition to the three tubs of cool whip stacked in our freezer, is a remnant of my parents' visit last month. First I sauteed the veggies with a little oil to cook them down to size. Then I mixed everything together in a bowl before pouring it into the crust. Oven at 350 for 45 minutes. I put foil around the edge of the crust to avoid over browning. Trouble was I forgot to take it off and so I think it didn't brown enough. Joe liked it though. My version doesn't use much cheese, so my digestive track can enjoy this as much as my mouth. Add three noodles to a 9x13, layer with sauce, 1/2 of the meat mixture and a layer of zucchini slices. Sprinkle parmesan if desired. Add more sauce then add the next layer of noodles. Repeat, then top with a layer of noodles, sauce and the mozzarella. Cook for about 45 minutes at 350, or until the cheese is browned. Place all ingredients in living room and wait 4 hours. blob with a little white head is our national bird, spotted by my coworker Emily's husband Rob, who is himself a Screaming Eagle with eagle eyes. Rob saw the bird before even the LBL staffers who were taking us on a winter eagle viewing tour. Looking at this spread, you might find it difficult to believe that one of Joe's and my new year's resolutions is to lose some weight.